Can I add or attach a pic, video, url or pdf doc to my wack? Absolutely! You'll want to add a photo, video, url web address, or doc to your wack experience whenever you can. Add one, or even all four types of attachments: when users Rate your wack, or Comment on it, they’ll be considering that incredible shot, clip or fancy pdf you've been so diligent in attaching. Include one or more, to boost your odds of reaching Wacktrap front page glory! Make your best wacks even better: add that exclusive shot or clip that simply has to be seen to be believed. Don’t miss your chance to snap that shot and upload it fast: whether it’s on your mobile phone, camera, camcorder, you can attach it to your wack in an instant. To make it easy, we’ll give you just the right spot to plug in that pic or video-right when you’re creating your wack. You’ll also earn extra Wack Stats for every pic, video, url or pdf you add to your wack-add one, or all four, and you’ll be rackin’ up Points fast! Questions about uploading images or video, or have a different question? Contact the Wacktrap Team now. Can I Search for wacks by specific company name or topic? That handy Search bar, found at the top right corner of every Wacktrap site page, will help you quickly locate user wacks, wack Comments and wack Ratings related to keywords for any topic and/or business or company name. How do I tell friends about my wack immediately? Now that you’ve posted your wack, you're gonna want to share it with friends, family, even co-workers. So we've made it a snap to get it to 'em fast. And you've got options: send it by wack mail, or send it directly to your account with Facebook or Twitter. With a click of our ‘Share’ Button, you'll be sendin' that wack instantly. What is a wack Rating? A wack Rating is represented by that row of mallets you see alongside every wack experience. It’s one of the most important parts of the Wacktrap site. That Rating, simply, is how highly members view a wack. 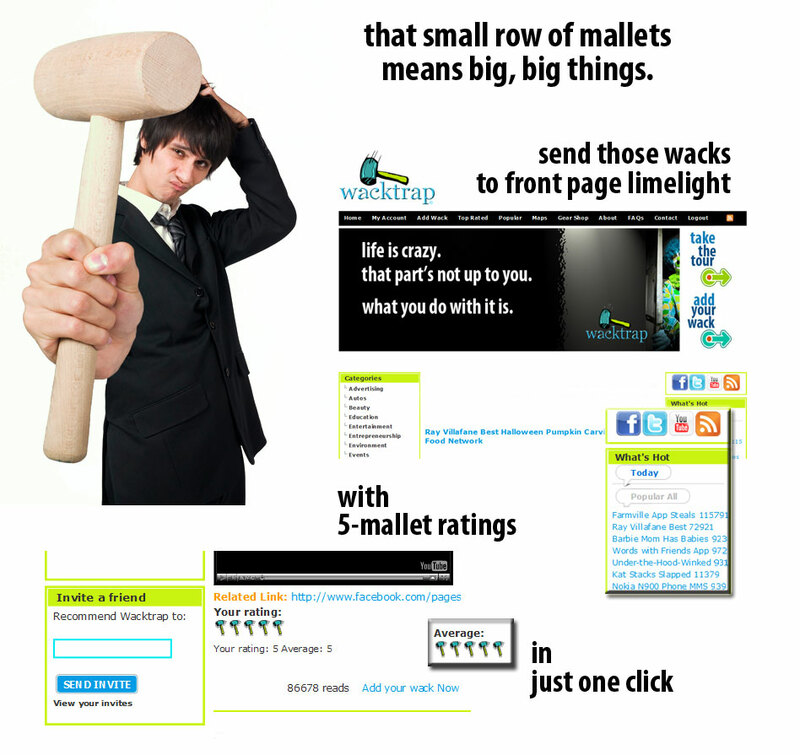 When members think a wack is great you'll know: the best wacks have a 5-mallet rating, and the best of the best make it to Wacktrap front page glory. What is a wack Comment? A wack Comment represents how you’re feelin’, and exactly what you’re thinkin’, about a wack. Any wack. At the base of every posted wack, you’ll see a handy box. That box speaks volumes. Quite simply, a wack is your experience. Your wacks–and the wacks of all our users-are the core of the Wacktrap site. I’ve heard of Wacktrap Forums. Just what’s it all about? Reality TV or tabloids got you believin you’ve heard it all? Wacktrap Forums may just take it up a notch. Stuff you were looking for. Stuff you didn’t expect. And stuff you thought you’d never find. One hot spot: you won’t be forgettin’ your visit here anytime soon. Get into these Forums and you’ll find our members have a thing, or ten, to say. And regardless of whether you agree with what you're hearin', there's one point of convergence: this experience is never boring. Absolutely! You'll want to add a photo, video, url web address, or doc to your wack experience whenever you can. Why send a Wacktrap Invitation? When you’re the ‘go to’ for advice, the latest, and greatest, do you really want to be the one leavin' your friends in the dark? Spread the wealth, share the knowledge. Why can I read a wack but not Rate or Comment? If you've landed on our site, you’ll be able to read wacks and the good stuff that accompanies those wacks you’re viewin'. Like their wack Ratings and wack Comments. But you won’t be able to do all the other good stuff, or participate on the Wacktrap site, before becoming a registered Member. We don’t ask for a lot. What are Wack Maps and Member Maps? Wacktrap Maps put things in perspective. You'll be selecting from two map types, from the top navigation bar.